Today, the audio amplifier failed on Andy Websters Sound-Generated Thread System. This was due to the dendrite growing to its maximum and shorting out the output stage of the amplifier. So I have brought in my trusty old amp I made when I was 15 (Sinclair kit), and connected a loudspeaker in series with the dendrite to save the amp, and am now passing rectified audio, rather than smoothed (1000uf). Direct AC may well be interesting as this would have an effect like the tide, eroding and depositing the metal ions in flux with the audio signal. Sound is being picked up in the space of other sound works with four microphones, and fed to the dendrite, especially influential are the wine glass tones from Tuning Pask’s Ear (by J.Bird & A.Webster) and the pulsing sounds of Dendrite (by Roman Kirschner). 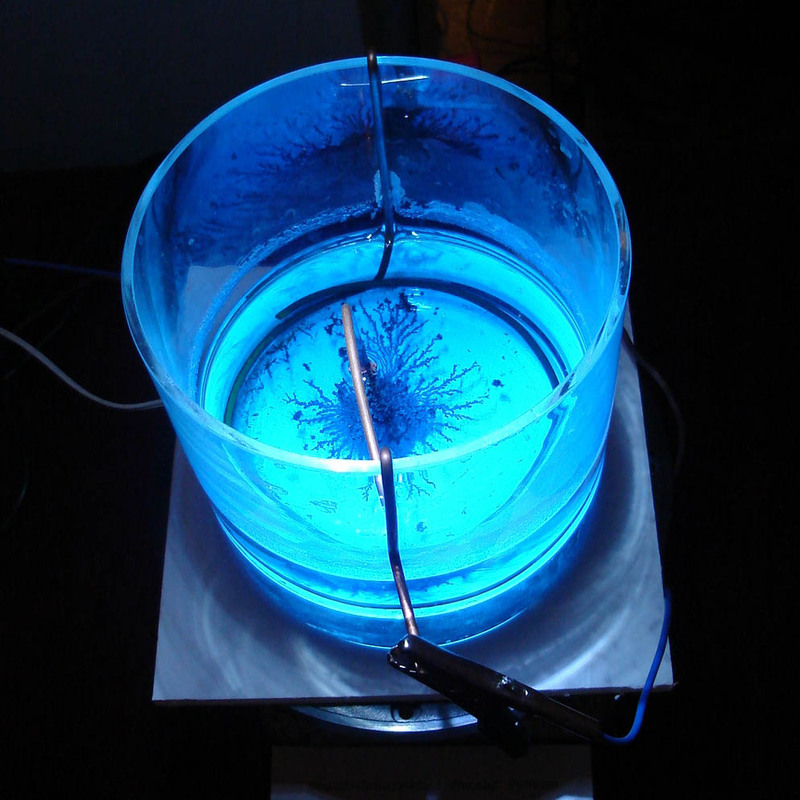 The glass vessel holding the electrodes and Copper Sulphate solution, rests via foamboard, on top of the upturned loudspeaker. Physical sound vibrations are now being fed to the dendrite, adding a feedback loop which may encourage dendrites to physically resonate with particular tones. The signal to the speaker is then likely to be modulated by dendritic formations so as to cause audio feedback. More sound of that particular frequency is encouraged, that sound gets louder, which may then reach a point where the dendrite shakes itself to bits. All speculation of course.